Hello again! While Ro was napping, I decided to be sneaky and sew her some valentines! Every day I swell up from all the love I feel for her, and having a full heart inspired this idea! I'm not an expert crafter by any means but it was so simple, I thought some of you could whip up some of these for last minute gifts during your free time today! 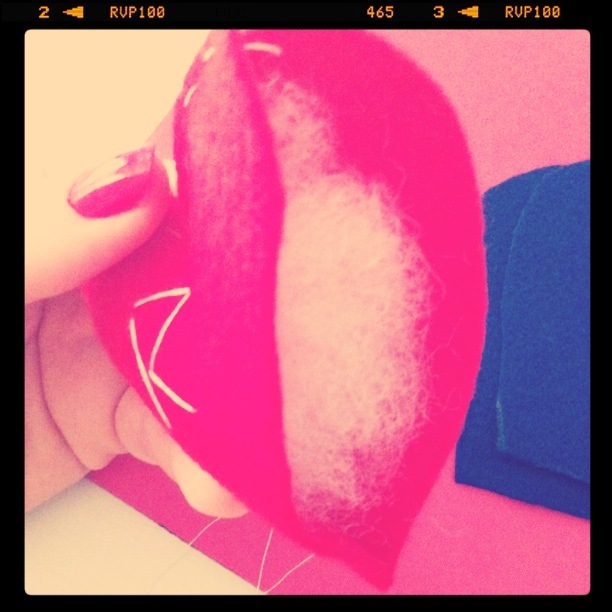 -Felt or any extra scraps of fabric. I just used solid colored felt because that's what I had but I think off beat/non-valentinesy patterns would be super cute too.. go crazy! -Thread in any color you like. Once again, go off beat and mismatched if you're feeling funky! -Fiberfill or even just cotton balls for stuffing! Cut your fabric into two equal sized heart shapes. Mine are about 4 inches long & wide and that's probably the smallest I'd go so that you have a comfortable amount of room for the stuffing, but they're still tiny! 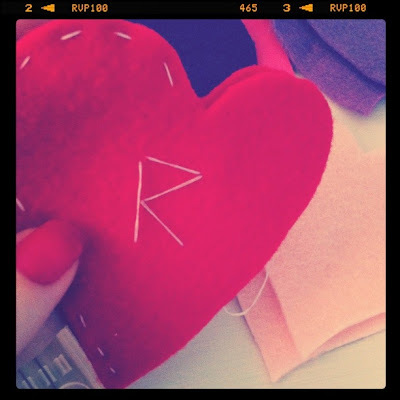 Thread your needle, tie off the end in a knot or two, place the two hearts shapes together, and start sewing from back to front around the edge of one side of the hearts. Afterward, I also took a moment to sew an "R" into only one of the two pieces of felt from the inside out to customize it, but these hearts are just as cute without doing so. A simple, fun, extra special valentine! 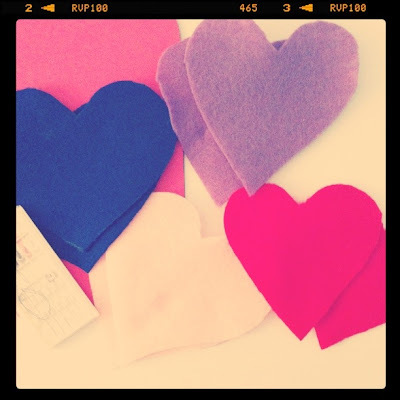 Enjoy having (and giving) a full heart! p.s. 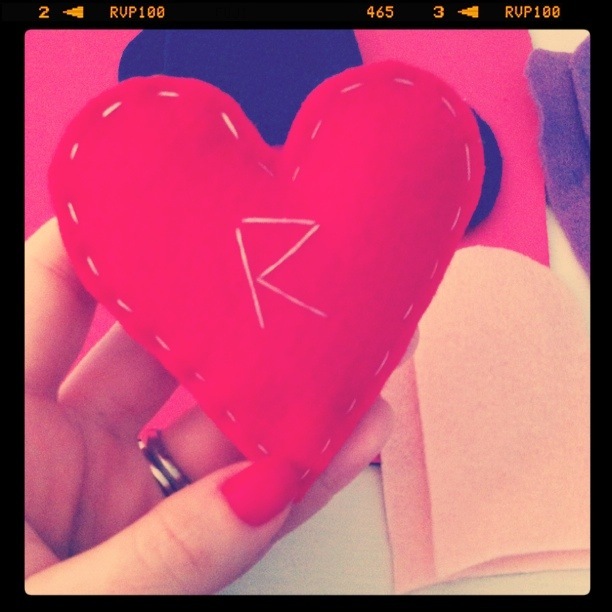 It would also be super cute to write a teeny tiny love note, surround it by the stuffing, and sew it inside.. making it a valentines love time capsule! Next year they can open it up and read it and you can give them a brand new one for the year afterward, and so on! Have fun with it! cute! :) isn't felt the best? you and your crafts! too cute!! Have a great heart day mama!! Love the love note idea! love these :) great idea! I need to start a little tradition with these! i LOVE the time capsule idea so much!!! too bad v day is almost over this year you will have to remind me next year so I can do it! What a cute idea Jess! good job jessica! you're pretty much the best mom ever!